Major Taylor is definitely a “local” race in my mind despite the two-hour drive. 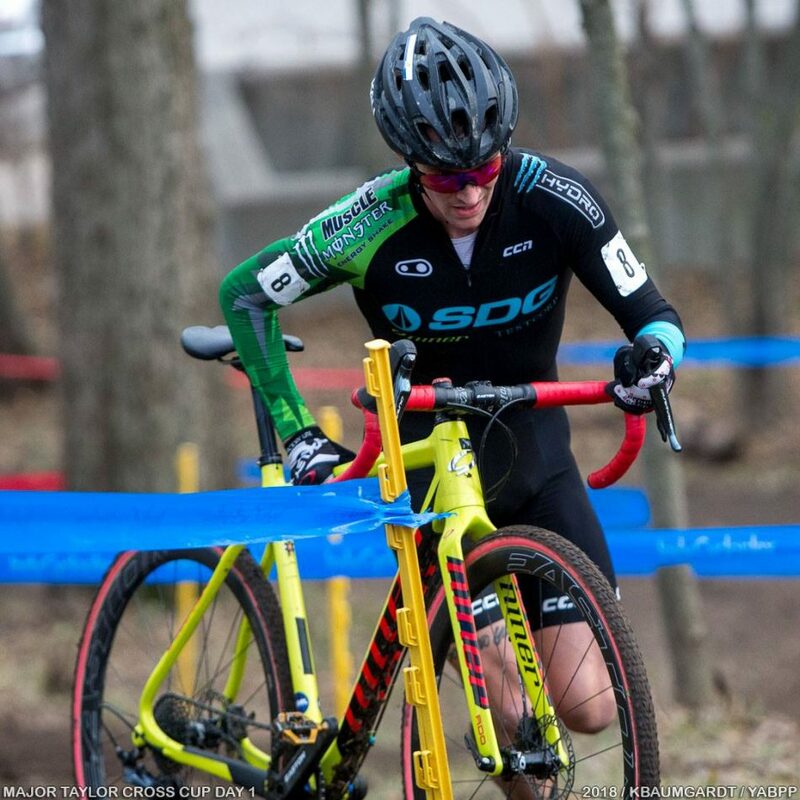 The course is located at the Indy Cycloplex which is about a half a mile away from Marian University, my Alma Mater, where I graduated in 2016. 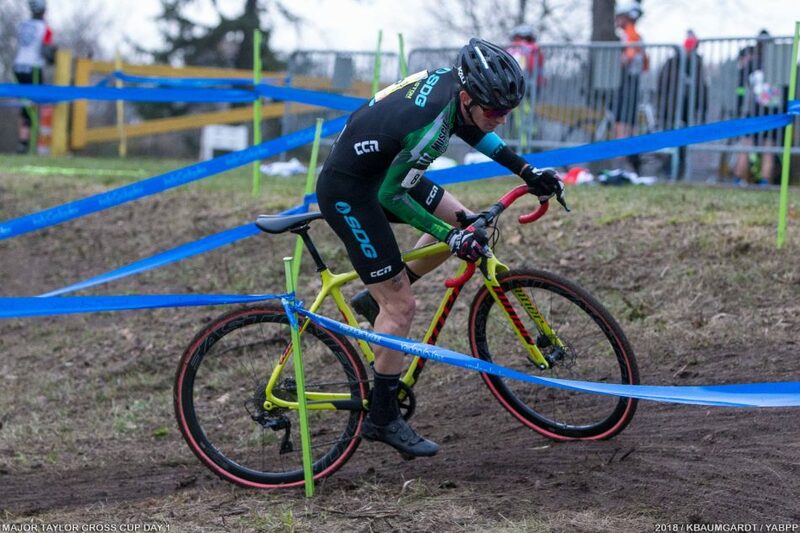 So needless to say I’ve spent plenty of time at the cycloplex over the years, including helping design the very course we raced this past weekend. I remember walking alongside the velodrome hill and about 15 of my Marian teammates just following me, plowing stakes as we walked. It was definitely a moment to remember because I was surprised Dean (Marian Cycling head coach) trusted me with that much responsibility. I was excited to talk to Dean this past weekend at the Major Taylor Cup and was reminded of the many good memories we have together. I am always greeted with a big smile and the nickname only Dean uses, “Dilly!” Being on the venue also brings back great memories of the Marian Cycling team, like the year me and Vance (both CX’ers) decided to “coach” our two buddies, Kaleb and Conor (both track sprinters) for the CX season, which included them using our B bikes and doing “hot laps” in the eco-lab which is a “no bikes allowed” area on campus. Kaleb, my “athlete,” managed to snap the entire chainring of my bike into 2 pieces. Quite a remarkable accomplishment I’d say. Back to the present day race. No special prep really needs to be made for the Major Taylor weekend. The race is known for being a mud fest in years past, but this year I saw that the conditions were going to be mostly dry so I didn’t even drive up from Louisville until the morning of the race. And I’ve ridden the course many times so I didn’t need to spend a ton of time getting familiar with the layout, but I did spend some time dialing in my lines on some of the tight corners along the velodrome hill during pre-ride. 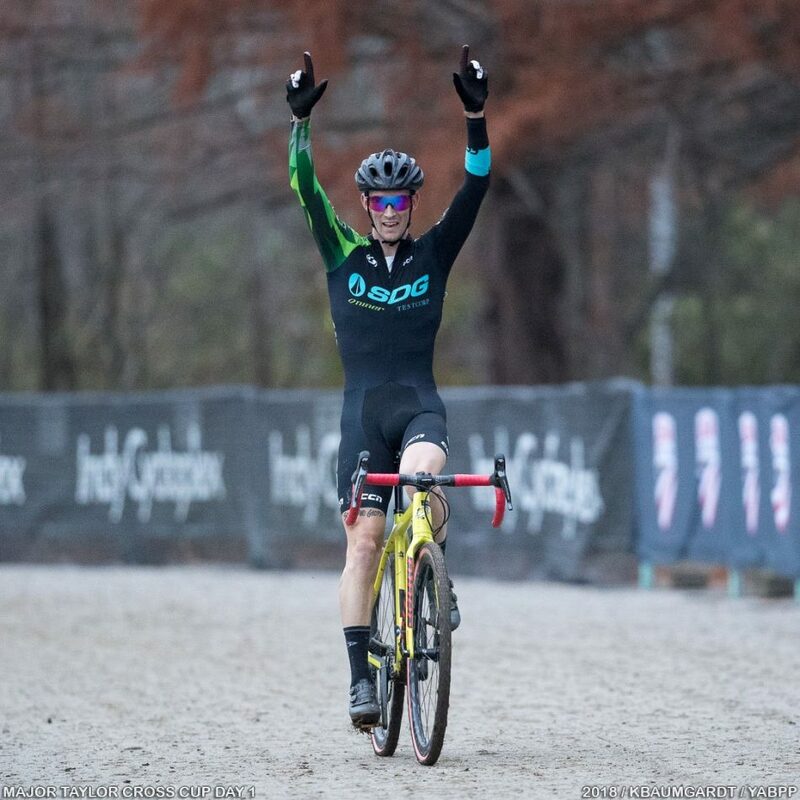 After breaking my hand at the Waterloo World Cup in September and taking 6 weeks away from racing I was still on the “come-back.” But Saturday proved to be a good show that the hand is fully healed and my fitness is on the rise. I felt great from the start. I had struggled with my starts since the hand injury because I was having a hard time gripping the bars and shifting at the same time, but that wasn’t a problem as I found myself in the top 3 off the start pavement. And after half a lap I found myself moving to the front and getting a small gap so I jumped on the opportunity and opened it up. Before I knew it I had a decent gap and Jamey Driscoll was chasing hard. Three laps in and he was only a mere eight seconds behind me and gaining. I had contemplated throwing in the towel, but somehow kept pushing and slowly the gap opened to 12 seconds and eventually out to 20+ seconds. It was a great day on the bike and a great feeling after a rough start to the season. I was also grateful for support from my team SDG-Muscle Monster and the Aether Racing crew for trusting in the process and believing in me despite a big setback early in the season. Sunday was a bit different. I still had a good start and was leading for the first two laps but I could feel that my legs didn’t have as much “pop” out of the turns. Saturday had definitely left its mark. So I decided to sit back a bit and see how the race played out. I did make one mistake about halfway through that forced me to chase back to the leaders for a lap, but I managed to get back to the front and stay safe the rest of the race. I was leading into the velodrome hill portion of the course each lap because I knew being in the lead through the technical ups and downs was the safest place to be. Even if I made a mistake I wouldn’t get gapped by the other riders. With one and a half laps to go I tried to put a dig on the run-up but didn’t get much of a gap and we all came back together. By the last lap, it was just Eric Brunner and myself left of the lead group. Eric had been hopping the barriers and just as I had thought he would, he attacked hard on the straight before the barriers causing me to chase. He got a clean go at the barriers but I was able to run and stay on his wheel through the last few tight turns. I came onto the pavement right behind him and started to come around, but just ran out of pavement. He beat me about half a wheel. 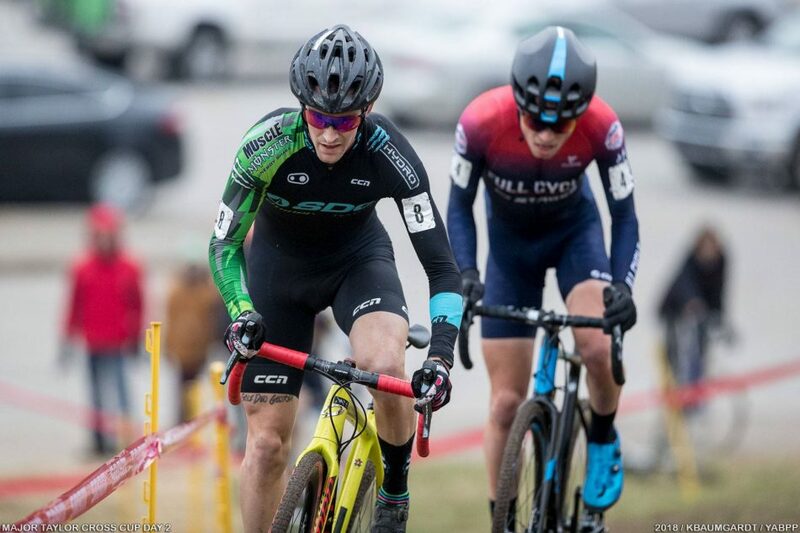 It was a very hard-fought battle and I know I didn’t race as aggressively as I wanted, but it’s a good sign that my fitness is in a good place for nationals in a few short weeks.